200m2 has launched a new online exhibition design tool called X-Sketch. X-Sketch is a step-by-step 3D exhibition stand design tool and arguably the easiest to use piece of exhibition design software currently available! 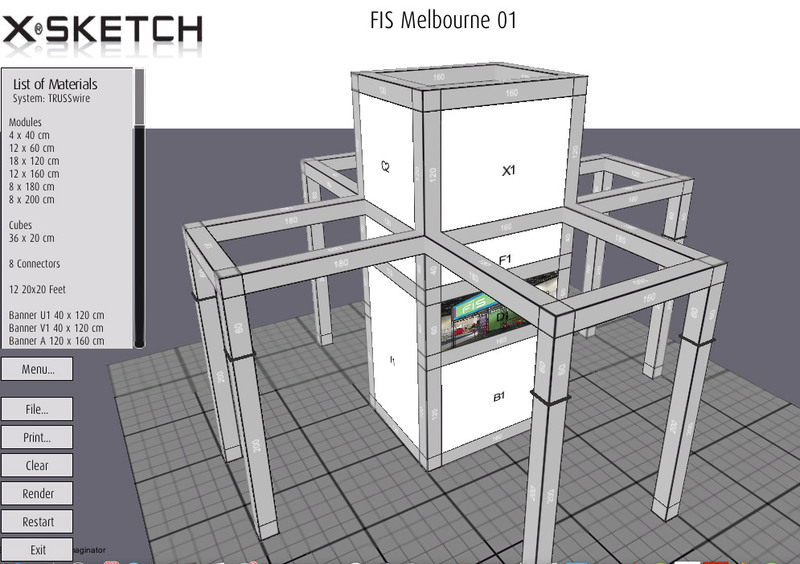 X-Sketch is a natural extension of 200m2’s modular exhibition solutions. Because our solutions are ‘modular’, our customers are able to reconfigure and redeploy their infrastructure to suit virtually any floor space – indoor or outdoor. X-Sketch gives organisations with busy exhibition programmes the tools they need to plan and refresh designs well in advance. This gives our customers total flexibility when it comes to exhibition stand design. They can refresh their messages and display panels for every exhibition. X-Sketch further improves the flexibility of the modular concept as it quickly gives brand manages the tools they need to visualise the impact of their latest stand design. This new 3D exhibition design software allows companies to design and mock-up multiple exhibition stand concepts at the same time. What’s more the tool provides guidelines for measurements, available parts and span specifications. Just like all X-module products, X-Sketch is extremely intuitive and easy to use. X-Sketch works with all of 200m2’s modular exhibition stand concepts including X-10 CROSSwire, X-15 EXPOwire and X-20 TRUSSwire. Together they make up the most flexible and scalable exhibition stand system in the world today. X-Sketch is FREE to use online. It can also be downloaded on to remote computers and is Windows and OSX (Mac) compatible. With the download version, you can add your own images to the display panels and even print off your sketches locally! Simply download and extract the .ZIP file and install within seconds!